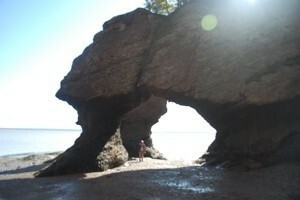 This is in New Brunswick Canada. A wonderful place to see the effects of the ocean on the rocks. When the tide is out, you can walk on the ocean floor through these tunnels formed by the water. A interesting place to take pictures. We visited here last fall just before the snow fell and the site was closed off for the season.